Sensirion has today announced a new series of sensors called the LD20. This cost-effective sensor can measure Bidirectional Liquid Flow rates in the micro and milliliter per hour range that is from 1000ml/h to single-digit ml/h with steady precision and response time of less than 50ms. It also has a built-in failure detection mode which can detect common failures like occlusion, free flow or air bubbles. The pump used to push the liquid in the sensor comes from Quantex and since it is based on the fixed displacement principle it is much less sensitive to line pressure, fluid viscosity and flow rate. 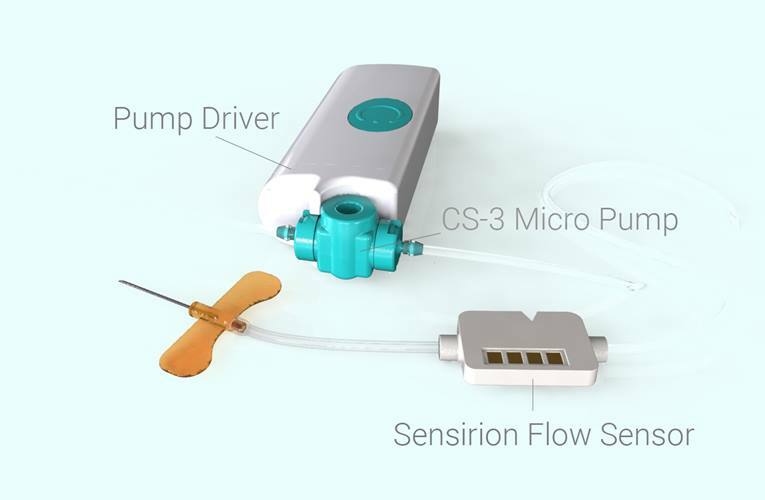 The compactness, low power consumption and cost-effectiveness of both, sensor and pump, allow the design of a wearable device which controls and monitors the drug delivery therapy simultaneously. For instance the sensor is can be used in a wearable drug delivery IoT platform, to integrate connectivity to the modular drug delivery system and monitor the therapy continuously for safe ambulatory treatments. The sensor is said to be demonstrated with a smart drug delivery platform using a demonstrator at the MD&M West in Anaheim on February 5 to 7. You can also visit the official Sensirion website for more information.